This consumer toolkit from the National Reverse Mortgage Lenders Association will help older homeowners consider whether their current home environment will best serve their needs as they age. 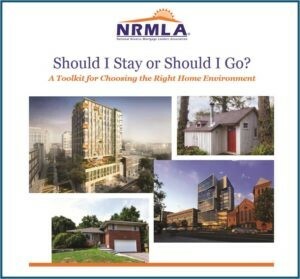 NRMLA’s toolkit guides readers through a wide selection of housing possibilities. As reverse mortgage professionals and members of the National Reverse Mortgage Lenders Association, we educate consumers about using their home equity to help finance retirement. But, not everyone can qualify for a reverse mortgage, and not everyone is in the best home setting to serve their needs as they age. Where older adults choose to age requires consideration of functionality, location, availability of services and affordability. This toolkit is free to download.